The global audiological devices market was valued at US$ 8.7 Bn in 2017. 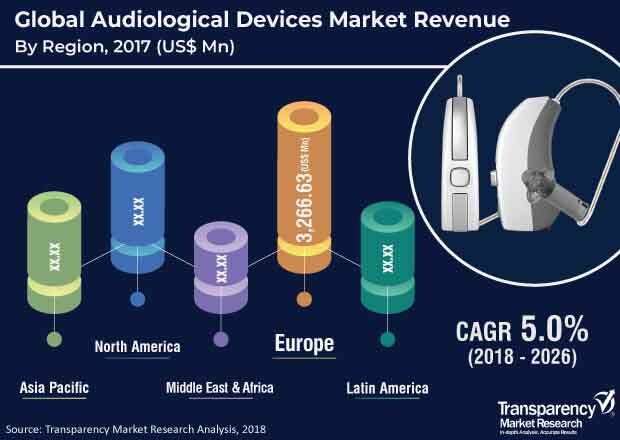 It is projected to expand at a compound annual growth rate (CAGR) of 5.0% from 2018 to 2026, according to a new report published by Transparency Market Research (TMR) titled “Audiological Devices Market Global Industry Analysis, Size, Share, Growth, Trends, and Forecast, 2018–2026”. The report suggests that increase in the geriatric population and number of hearing impairment cases is expected to propel the audiological devices market in the near future. Europe is expected to dominate the global market, owing to the high geriatric population, rise in patient population, and increase in number of technological advances. The market in Asia Pacific is expected to expand at a CAGR of 6.5% during the forecast period, due to the increasing geriatric population, rising awareness, and growing patient population cases in the region. Moreover, research and development activities and initiatives by governments in the healthcare sector are anticipated to further boost the market in Asia Pacific. The global audiological devices is expected to be potentially driven by value added features offered by various audiological devices in order to provide appropriate diagnosis, efficient treatment, generating positive outcomes, and suitable medical aid and care. According to WHO, in 2018, worldwide, approximately 466 million people had disabling hearing loss, and among them, 34 million were children. It is anticipated that by 2050, around 900 million people would have disabling hearing loss. Key players offering audiological devices in the market are providing value added features such as launching products with more technological advancements, more efficacy, and technical features, offering effective care, thus providing an enhanced product as compared to existing products in the market. Therefore, companies are focusing on research and developmental activities, thereby providing value added features in audiological devices. For individuals with mild to moderate hearing loss, traditional hearing aids are prescribed by medical professionals. These are less expensive and offer more flexibility; however, these instruments don’t process sound like cochlear implants. Cochlear implants are utilized for severe hearing impairment, and people who cannot be assisted with hearing aids. Cochlear implants can be used by both adults and children. Patient population with profound hearing loss or deafness have sensorineural hearing loss, in which there is damage to the minuscule hair cells in the inner ear, in a part called the cochlea. Hearing aids, are used to make sounds louder, while cochlear implants are used to simulate the function of inner ear’s (cochlea) damaged parts and transmit sound signals to the brain. According to The Ear Foundation, there are approximately 14,000 implant users in the U.K., and around 700 adults and 550 children are implanted every year. The report offers the detailed segmentation of audiological devices in terms of diseases, into otosclerosis, Meniere’s disease, acoustic tumors, otitis media, and others. Meniere's disease and otitis media disease segments are projected to account for a leading share of the market during the forecast period. Increasing geriatric population, rising hearing loss among both children and adults, and increasing prevalence and incidence cases of these diseases are key factors that are expected to propel the audiological devices market. Moreover, extensive research & developmental activities and increasing interest of scientists in research for treatment of these diseases enhance their lead in the market. Europe accounted for key share of the global audiological devices market, and the market in the region likely to expand in the near future. Rapid increase in the geriatric population, increase in population of patients, surge in the number of medical professionals, and extensive research and development for providing more efficient and advanced products are key factors boosting the audiological devices market in Europe. Moreover, rise in the numbers of players and their increasing mergers and acquisitions, along with the increasing acceptance by patient population for adoption of advanced technologies are responsible for boosting the market in Europe. The market in Asia Pacific is projected to expand rapidly during the forecast period. Increasing geriatric population, rising prevalence of hearing loss causing diseases, growing research and development, extensive government initiatives in the healthcare sector, and growing presence and investments by global key players in Asia Pacific are propelling the market in Asia Pacific. The report also provide profiles of leading players functioning in global audiology devices market. William Demant Holding A/S, GN Store Nord A/S, Sonova, WIDEX A/S, Sivantos Pte. Ltd., Medtronic, Starkey, Audina Hearing Instruments, Inc., AUDITDATA, and Nurotron Biotechnology Co. Ltd. are major leading players operating in the global audiological devices market and account for significant market share. Companies functioning in the audiological devices industry are focused on strengthening their geographic presence through strategic acquisitions, collaborations, and mergers with audiological devices market players in respective domains and geographies. Strong progressive research and development activities and increasing high tech advancements are key strategies adopted by major players to consolidate their position in the global audiological devices market.